One of my recent Vancouver spa discoveries is 4 Angels Beauty Care on Burrard Street. I took an extended lunch hour and booked a Valentine’s Day afternoon session of two treatments: an Indian Head massage and a neck and shoulder massage. 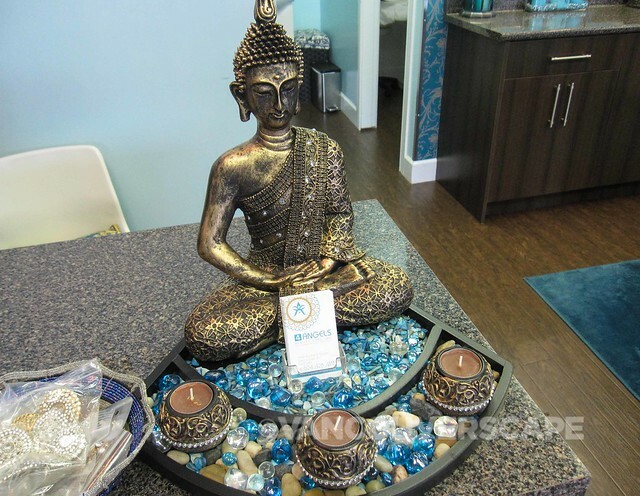 Owners Navkiran “Kiran” Sokhi and Kulwinder Malhi have collectively been in the beauty business for close to 35 years, and opened their Vancouver spa just eight months ago. Kiran started her cosmetology career 20 years ago in India, moving to Canada in 2005 to continue working in the beauty industry, receiving a Vancouver Tourism Award nomination for service excellence. Kulwinder is trained in all aspects of beauty from waxing to massages. She’s been a licensed esthetician for 15 years. Between the two ladies, a wide range of massages, facial treatments, and other services can be had in their lovely, brightly coloured day spa. Back to the massages. Kulwinder started with an Indian Head massage (30 minutes, $35), using fragrant Aragon oil originating from Morocco (you can also choose from castor, almond, olive, or baby oils). Initial strokes and rubbing gave way to gentle pulls and massaging. My hair felt soft and light with the oil worked through, and the half-hour treatment allowed me to unwind from a busy morning. I learned that a traditional Indian Head massage can improve your blood circulation while stimulating hair growth and aiding mental concentration, good things that we can all benefit from. The 30-minute neck and shoulder massage ($25) was next. Again, more gentle kneading and lifting of my neck, this time with a softly-scented lotion, until my muscles started to completely relax and loosen up. Kulwinder often asked me if the pressure was OK and her calming spirit added to the blissful experience. By the time she was finished, my rhythm was peaceful and slower, yet not to the point of falling asleep. In fact, I walked home in the mild winter weather, enjoying the fresh air while my hair still smelled of the fragrant oil from a faraway land. 4 Angels Beauty Care also carries their own branded line of Canadian, cruelty-free cosmetics as well as jewellery. They can help you wrap a sari for your next event, and also offer birthday and wedding parties for up to eight people. Henna application varies in price, design, style, and location (small henna designs start at $5). Find 4 Angels Beauty Care on 1342 Burrard Street (between Pacific and Drake) in Vancouver. My massages were courtesy of 4 Angels Beauty Care, for the purpose of writing this feature.